Buddhist Circuit of India is on the threshold of transformation. The policy makers have clearly identified the tourism potentials of Buddhist heritage sites. In the current budget policies, Buddhist circuit is given a due weightage in terms of promotion of this special pilgrimage circuit with numerous schemes. Minister of Railways in rail budget 2014 declared that special tourist train will be launched to connect the country’s prestigious Buddhist Circuit. The Buddhist heritage is deeply etched in the soul of India. There are many destinations that encapsulate the essence of Lord Buddha. He wandered as a monk, gained enlightenment, preached many sermons and completed his course of life in India. The places where he spent his life have now become highly respected pilgrimage sites. Therefore, tourists and pilgrims prefer to visit such places to gain a new perspective of peaceful and contented life. Buddhist pilgrimage is an experiential journey where visitors learn about Buddha and gain inspiration from his life. From Bodhgaya where he gained his enlightenment to Varanasi where he preached his first sermon. From Sravasti where he spent maximum monsoons as a monk to Kushinagar where he gained his final Mahaparinirwan, the sites encapsulate the essence of Buddha. Tourists still feel the calming bliss during their visit to such sites. These instances where travellers feel inspired and blessed by the life of Buddha bring out one of the best pilgrimage experiences in the country. The introduction of this special tourist train will connect such important Buddhist destinations and strengthen their connectivity. Moreover, it will also encourage tourists to plan their travel easily. Collectively, they can visit the sites in a single itinerary on a train. The hassles of staying, eating, travelling; all will be comprehensively addressed during this special train tour. The visitors interested in taking up Buddhist-Pilgrimage just have to book their seat on this special train. 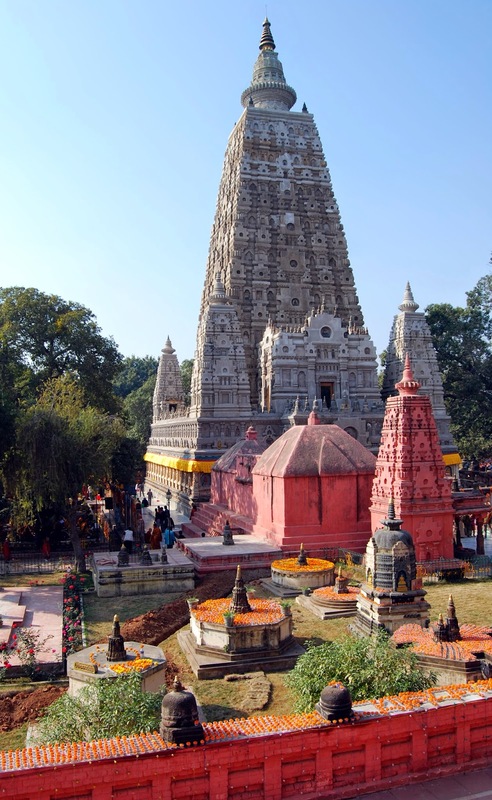 Rest of the exceptional travel experiences will come up with a visit to Bodhgaya, Sarnath near Varanasi and Lumbini. You can also gain the new perspectives of life during your Buddhist Pilgrimage tour. Andhra Pradesh is the most visited state of India. Every year millions of tourists arrive not just to experience the metropolitan charm of the state, but also to experience the rich Buddhist legacy of the region in the form of Nagarjunakonda and Amaravathi. Located on the banks of the Krishna, Amaravathi features fine carvings surrounding the remains of a great Buddhist stupa. The location as per the excavations reveals that the Buddhist settlement flourished around this immortal city under the reign of Mauryan Emperor Ashoka. Under his rule, the settlement of monks established the Great Stupa. The construction was completed in 200 CE. The base of this stupa in South India is decorated with carved panels that narrate the story of Buddha's life. Even ideas and inspirations of Jataka Tales have been presented on the carved panels here. The free standing Buddha figures and limestone reliefs are now in ruins, but they have the power to take back the tourists to the ancient Buddhist spiritual art. Even during excavations, the sculptures, bas relief medallions and paneled friezes that once adorned the stupa have been discovered. Also during excavations, the remains of the Ashokan Pillar have been found, which surely make the site unique, as this is first of a kind example of Mauryan art in South India. Other important site, Nagarjunakonda is reminiscent of the arrival of the spiritual master, Nagarjuna, an Indian Buddhist philosopher who articulated the doctrine of emptiness in South India. Located on a island near Nagarjuna Sagar, this is a historical hill famous for serving Buddhists during their initiation and learning. One of India’s richest Buddhist sites, Nagarjunakonda in its heydays hosted many Buddhist universities and monasteries. Here, they learnt the principles and practiced philosophy of Buddhism. Students from the countries like China, Gandhara, Sri Lanka and Bengal used to come here for study as well. Presently, the ruins dot the island with the heritage of Buddhism that flourished under Nagarjuna. Presently Nagarjunakonda constitutes of a restored Buddhist site on an island which symbolizes a lost civilization that flourished thousand years ago. The excavations here have yielded 30 Buddhist monasteries that illustrate the presence and strong foothold of Buddhism in the city. Other remained excavations here feature a Maha Chaitya, Viharas, Buddha statues, relics, stone images, Jataka tales encrypted panels and other items of Buddhist origin. Apart from Buddhist pilgrimage sites, Andhra Pradesh is also known for another renowned pilgrimage experience in the form of Tirupati shrine. Located within the seven hills, denoting the seven heads of Adisesha, the sacred temple is dedicated to Lord Venkateswara or Balaji and is also one of the richest pilgrimages in the world visited by millions of devotees every year. More of the Buddhist heritage of Andhra Pradesh can be seen and experienced during a visit to the Andhra Pradesh Buddhist tour. We all follow Buddha under the concept of Buddhism. His sculpted representation in the form of Abhaya (fearless), Bhumisparsha, or Dharma Chakra Pravartana Mudra (first sermon) inspires us to recall this great philosopher personality and his greatest wisdom. The idols and images are not the matter of devotion, but are seen as an inspiration to strive towards the Middle Path and achieve the highest wisdom or enlightenment. In ancient time, Buddha was followed through his teachings. But where did we get the pictorial representation of Buddha in deep meditative pose with a divine calm on his face? The answer to this is Mathura. Located in western Uttar Pradesh, the location is primarily associated with Hindu God Krishna’s birth and adulthood. But a part of Buddhist history also is associated with Mathura. The land has been sacred since antiquity as Buddha himself founded monasteries here. According to Fa Hian’s travel accounts, this region during 78 AD held twenty Buddhist monasteries with about three thousand resident monks. Another landmark development here associated with Buddhism is the Mathurā School of Buddhist art. Here, it is believed that many carvers here worked relentlessly to create the Buddha in human form. The modern day idol featuring the benign long ear Buddha’s statues in meditative pose is a result of Buddha’s pictorial manifestation. This development of interesting Buddhist art flourished during 2nd century BC to the 12th century AD under the patronship of Kushana and Gupta rule. The Mathura School of art (India) was contemporary with the Gandhara School of art in the modern day Afghanistan. But both the sculpted representations differ in their appearance and representations. Its sculptures depict Buddha in Abhaya mudra, Gandhara statues depict robed Buddha in standing pose. It is even believed that it even served as an exporter of Buddhist sculptures. The journey of evolution in Buddhist visual art here can be observed in the city’s Archaeological Museum. Here, tourists can actually see the variety of Buddhist sculptures and their successive interpretations in a unique way. In modern times, the city’s Buddhist heritage can be experienced with a visit to this museum. During a visit to Mathura, tourists and pilgrims can revisit the location where Buddhists got the gift of Buddha sculpture to revere his wisdom, benevolence and compassion in virtual form. The Buddhist heritage of Maharashtra is characterized by the number of caves the state possesses. Undoubtedly, Maharashtra boasts the largest number of caves; most of them have Buddhist roots. Caves take tourists back in time. They might be surrounded by darkness inside, but present an illuminating and awe-inspiring experience to the travellers. Bestowed with architectural and artistic wonders, these caves act as a protector for the treasure trove of Buddhist heritage. Three of the famous Buddhist caves i.e. Ajanta, Ellora and Elephanta are even regarded as world heritage sites. Many of the Buddhist caves in Maharashtra contain the finest carvings and murals of the country. If one observes the carvings in detail, one can find out a lot about the bygone Buddhist era. One can proudly say that the state has to its credit the oldest and the finest cave complex in the form of Ajanta Caves. An ancient Buddhist art gallery stored within a cave, Ajanta is a masterpiece of mural representation based on the life of Buddha and many Jataka tales. Believed to be created by monks living under cave shelters in 2nd century, the murals here depict pure devotion. That is why the final product of Ajanta Caves even after thousands of years still is admired for its beauty and unique heritage. Another renowned Buddhist cave complex in Maharashtra is Ellora Caves. The second of the world heritage site in the series, Ellora Caves display the coexistence of three faiths under the same cave shelter complex. Based on excellence of rock-cut architecture, the cave complex features 34 caves dedicated to Buddhist, Hindu and Jain religion. The structures here can be interpreted as viharas or monasteries and rock-cut temples. Out of all the attractions in Ellora, Kailashnatha is undoubtedly the centerpiece of the complex. Carved of the single rock, the structure here is believed to be inspired by Mount Kailash, the abode of Lord Shiva and is the prime attraction of Ellora caves. Another Buddhist cave in the state is Kanheri Caves. Located near Mumbai, Kanheri Caves depict the Buddhist influence. The cave complex here also features Buddhist monasteries, congregation halls, stupas, and intricate rich Buddhist reliefs; Kanheri was an important Buddhist settlement in Konkan coast. The Pithalkhora cave in the Western Ghats of Maharashtra is a 3rd century Buddhist site consisting of 14 rock-cut cave monuments. Made of basalt completely, the caves are presently in ruins and have the remains of chaityas and monasteries. 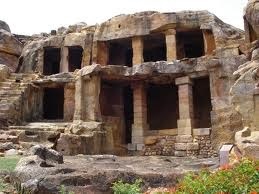 Junnar Caves also deserve mention when it comes for Buddhist Heritage Caves. The caves have a Chaitya hall with circular dome ceiling and lie within the first group here, known as Tulija lena Group of caves. The second group, i.e. Ganesh Lena cave is also very beautiful and attracts a lot of tourist population. It also has a vihara or monastic shelter featuring many small cells and chaityas. Elephanta cave complex is another cave treasured on an island 9 km offshore Mumbai. It displays a unique blend of Hindu and Buddhist Cave Temples. The larger group here comprises of five Hindu caves and the smaller group here has two Buddhist caves. Predominantly based on basalt rock cuts, the caves here are renowned for three faced Shiva statue depicting his role as an inceptor, nurturer and destroyer of existence. It is also a world heritage site. Similarly, there are many other cave complexes in Maharashtra that illustrate the presence of Buddhism in the region since ancient times. To know more about Maharashtra Buddhist Heritage, tourists can visit the above mentioned locations to understand the elaborate world of ancient caves in India. The centermost state of India, Madhya Pradesh is an important stopover for a Buddhist follower. It has been placed on the Buddhist world map as the important link in the growth and development of the faith during the time of Emperor Ashoka. The state is renowned worldwide for a world famous Buddhist Pilgrimage spot; Sanchi was created by the glorious Mauryan ruler, Ashoka during 3rd – 12th century BC. His wife, Queen Devi was a daughter of a merchant from Vidisha, an ancient kingdom in Madhya Pradesh. Her strong connect with Vidisha made the king lay the foundation of religious center, Sanchi. Also, the king overwhelmed with the devastating effects of Kalinga war built the complex as a penance. 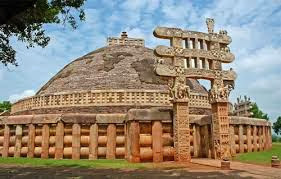 Over the nine centuries, the group of monuments at Sanchi hill acquired the status as the masterpieces of Buddhist art. The complex hosts many stupas, intricately carved gateways or Toranas, monasteries, temples and pillars. Listed as world heritage site by UNESCO, the Buddhist site at Sanchi is one of the prime Buddhist pilgrimage sites in Madhya Pradesh. The balustrade surrounding Stupa 2, carved with an iconic representation of the Buddha, was added in the late 2nd century BC under the Satavahanas. This Buddhist attraction at Sanchi can be visited from Bhopal, the capital of Madhya Pradesh. Other important Buddhist shrines here include Deor Kothar in Rewa District and Dharmrajeshwar. Deor Kothar is known for Buddhist Stupas excavated in 1982. These stupas are credited to Mauryan emperor Ashoka the great for preaching the religion. Dharmrajeshwar complex on Chandangiri Hill includes a series of 14 rock cut Buddhist caves with monasteries and Stupas of the 7th century. The complex here features ruins of a well planned monastery with more than 70 living quarters, pavilions, meditation halls, stupas and images of Lord Buddha and his disciples. Truly, Madhya Pradesh is distinctive in terms of Buddhist heritage of the country and undoubtedly makes an enriching Buddhist tour. After Bihar and Uttar Pradesh, the next Indian state that stands out in terms of unique Buddhist heritage is definitely Odisha. Bestowed with distinctive and rich cultural heritage, this eastern Indian state is also slowly becoming famous for its Buddhist links. It all started during the times of Mauryan Emperor Ashoka’s rule. His gruesome attack on ancient Kalinga, the modern day Odisha in the third century BC resulted in a battle so violent that the carnage inspired Ashoka’s legendary conversion to Buddhism. He started resurrecting the Buddhist heritage sites through commissioning rock edicts around his empire and stupas, temples and pillars around the Buddhist sites of renown. Of all the Buddhist sites, the mighty Mauryan Emperor had a soft spot for Dhauli Hill in Odisha. It was here that the emperor underwent a psyche change and abandoned world conquest for spiritual conquest in the 3rd century BC. He embraced Buddhism here. There is a rock edict commissioned by the emperor himself that projects Dhauli near Daya river as the site of Kalinga war. 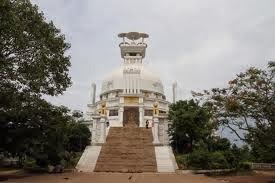 At present, the white Vishwa Shanti Stupa adorns the Dhauli Hill and overlooks the spot where the emperor annexed Kalinga in the decisive battle. Built in 1972 by an association of Japanese Buddhist followers, the modern stupa stands as a memorial to Ashoka’s legendary change of heart and spread of new wave of Buddhism. The next Buddhist attractions of Odisha are famous as a tourism circuit of Diamond Triangle Tour. Featuring a tour through Ratnagiri, Udayagiri and Lalitgiri, the journey brings the visitor closer to the unique Buddhist heritage of the land. Located close to Bhubaneshwar (capital of Odisha), these Buddhist heritage sites narrate the glory of region’s Buddhist links, present right from the times of Lord Buddha. The most impressive of the three sites is Ratnagiri (Hill of Jewels) which, between the 7th and 11th centuries, was a major Buddhist university and monastic settlement according to the accounts of Hiuen Tsang, a 7th century Chinese Traveller. Located on top of a mound, Ratnagiri is crowned by a large stupa and the best preserved structure here is a monastery with a central courtyard. The excavations here reveal the largest excavated monastery and Buddha’s sculptures. The largest Buddhist complex in Odisha belongs to Udayagiri, the sunrise hill. It was a monastic retreat which during excavations revealed with the presence of a monastery complex, a number of Buddhist sculptures and a brick stupa.The hill of grace i.e. Lalitgiri is believed to be the oldest of the Buddhist heritage sites in the state. The ruins, spread over two adjacent hills include a terraced stone platform, a gallery of life-size Bodhisattva figures and an apsidal temple. Odisha or Orissa is a rich repository of Buddhist heritage, visited by the travellers who are keen to trace the journey of the faith through different destinations in India. Uttar Pradesh state in India is the cradle of Buddhism in India. It is here actually that Buddha preached his first sermon. Graced by Lord Buddha most of the times post enlightenment, this Buddhist state is accredited to host many pilgrimage sites. Here, the spiritual master travelled extensively, preached many sermons and performed many miracles. Therefore, the presence of Buddha is absorbed completely in this Indian state. Of all the Buddhist sites in UP; Sarnath stands out because of its intrinsic association with the faith. Here, lord having attained enlightenment delivered his first sermon to his first five followers at the Isipattna or Deer Park. The first sermon included identification of four noble truths and adherence of middle path, balancing both material and spiritual life. Also, here he initiated Sangha, the communion of Buddha followers and turned the wheel of law here. This Buddhist site here holds reverence amongst pilgrims for the presence of its two stupas, Chaukhandi and Dhamekh. Also the site once hosted the Lion Capital Ashokan Pillar, which is the original inspiration behind the national emblem of India. Next prominent Buddhist destination here is Kushinagar. One of the four important Buddhist pilgrimage sites, it was here the lord left his corporeal self and attained final Mahaparinirvana. A temple and the Ramabhar stupa here are the center of devotion for Buddhist travellers. Sankisa or Sankassa, near Lucknow is associated with lord’s miracle. Here, Sakyamuni descended to earth after preaching the sermon to his mother in heaven. Ruins of an Ashokan Stupa and a temple dedicated to lord mother are the part of Buddhist heritage at Sankasia. Sravasti in eastern UP offers the most captivating experience to a pilgrim. This destination is mentioned in Buddhist texts as Jetavana monastery, the site where Lord Buddha spent 24 monsoon retreats. This site also hosted communion of Buddhist followers who gathered here to witness enlightening sermons by the master. The evocative ruins of monastery and stupas here are the center of attraction in Sravasti. Also, the sculptural representation of Lord Buddha is accredited to Mathura. Here, the skilled carvers, based on the textual description of the master carved and shaped up the sculptures of Lord Buddha that are seen as the object of devotion for every devout follower. The above mentioned sites comprise the illustrious Buddhist circuit of Uttar Pradesh and feature as the must visit destinations in the itinerary of every sentient pilgrim. Also, this northern state of India is an important part of Buddhist-Pilgrimage.